Completed comfortable apartment on the ground floor with garden use and many other amenities for the well-being. Special conditions for rent of the whole house and from a week stay. the romantic "Spatzlzimmer" with double bed, furniture in the Allgäu ambience (Voglauer style) and two windows overlooking the garden and on the forest and meadows. The living room can also be used as common room and is also suitable for seminars, conferences etc ..
Modern conference technology (video projector, flipchart, presentation case, etc.). Fast Internet with 50,000 Mbit Internet (LAN and WLAN). That and more offers by the German Tourism Association (DTV) 5-star holiday home "book house Square" near the forest on a hill above the Fichtelgebirgshalle mountain town Kirchenlamitz. In this maximum classification comes out comfort and quality facilities also - literally - maintained cleanliness expressed. It is maintained by two housekeepers under the direction of their employer. The postal address was the unique holiday home not only his name but also became the program. So, guests may use more than a thousand books comprehensive home library for free use available. Two other apartments in the same building are also each self-contained and comfortable as well-equipped. The house can be rented for up to 12 people completely. - Pet: per object and day costs of 10 EUR (compulsory). 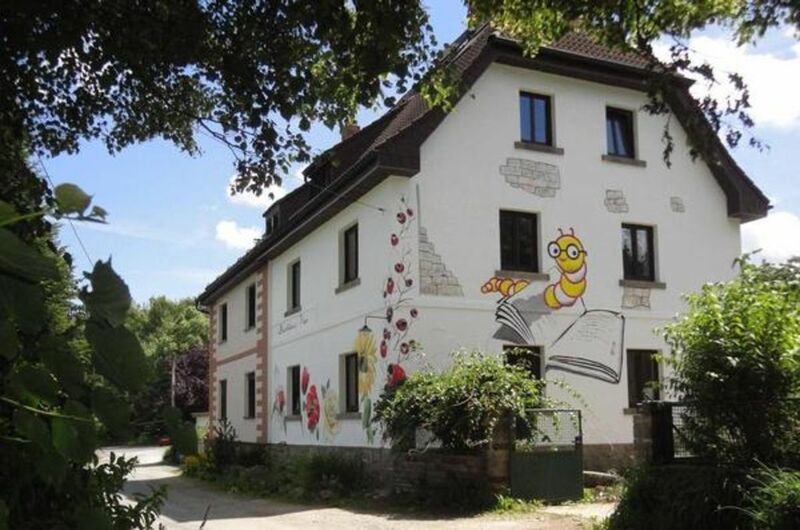 The 5-star guest house (F) "Buchhaus Four" is located on well-developed bicycle and hiking trails. The surrounding area offers various actuation options. The playing guest performances in the former porcelain factory "Radquartier" has nationwide as extreme sports hall and international importance. Kirchenlamitz belongs to the district Wunsiedel, nearest towns are Hof / Saale (20 km), Wunsiedel (17 km), Selb (12 km), Asch / Czech Republic (22 km), Bayreuth (50 km) Plauen (60 km), Zwickau (98 km), Nuremberg (120 km).